At last it’s summer and Dorking Talking gets out and about. In the town, there’s the High Street update, while a little further afield we’ve got news of June events at the various National Trust properties in our area, as well as an account of some of the remarkable women who lived there, before making time for tea at Newlands Corner and reporting on May’s Surrey County Show. Indoors there’s news of the Listening Eye telephone support service and also of a speaking clock with its eye on your medication… and we meet Talking Newspaper Reader Roy Turner. Happy Birthday to us! Our 30th birthday tea was a huge success and we’ve sprinkled bits of it through May’s Dorking Talking (in sound, not cake crumbs…). After the Chairman’s Report, a word from one of the very first listeners and then great entertainment from local actor Stephen Mann and our own Reader Val Collins. We’ve got information as well as fun – the latest from the High Street, one of Sight for Surrey’s volunteer drivers, non-slip surfaces for the kitchen and board games made accessible for people with poor sight. We also have bellringers with a bold ambition for the centenary Armistice Day celebration and meet Reader and hand-bell ringer Thurza Plumb. 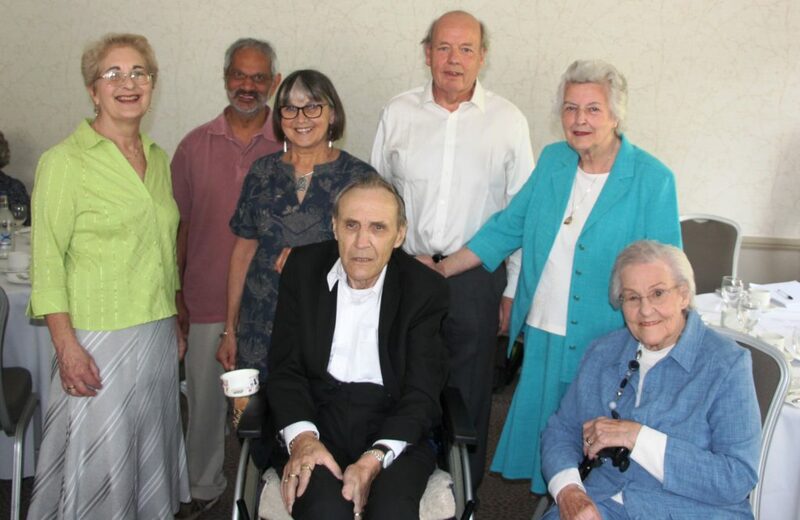 Volunteers and listeners met on Sunday 22 April at The Burford Bridge Hotel to celebrate 30 years of the Dorking & District Talking Newspaper. “Having produced more than 1500 recordings, we felt that the time was about right to celebrate!” said Chairman Sarah Sheridan. Before the party got going, the afternoon started with the AGM at which Sarah welcomed everyone and thanked Volunteers and Listeners for their continued support. Mike Bryne, the Treasurer, submitted his report and particularly mentioned a very generous donation from local insurance company Unum which enabled the rent on the recording studio to be paid for the next two years. Some 50 volunteers, listeners and their guests were present including Maureen Cole, Liz Cunnell, Jessica & Dave Thurtell and Rai & Ellie Patel who were all founder volunteers. They were joined by David Martin, who received the very first recording all those years ago and is still listening. He gave a speech thanking the volunteers and explained how cut off he would feel without receiving his recording each week. “It keeps me in touch with what’s going on in the town,” he said. Readers often say how upset they feel if they stumble over words or, heaven forbid, get a fit of the giggles so it was lovely to hear from one listener that these occasions are the best bits as she also has a chuckle! After a delicious tea of finger sandwiches, cakes and scones with jam and cream local actor and raconteur Steven Mann took the stage, with one of DDTN’s very own Readers, Val Collins, to entertain us with readings and songs. It proved to be a very special afternoon for all involved – and the sun also shone! It’s Spring… it’s Easter… it’s April’s Dorking Talking! This month we’re catching up with volunteers, looking at what’s happening on Dorking High Street and hearing about a possible true “miracle cure” for macular degeneration. If you like exploring, find out why it’s worth registering as sight impaired; hear about about a personalised sighted guiding scheme and discuss how to make buildings more accessible to people with sight loss. On the other hand if history’s your thing, we uncover Britain’s first Brexit (much, much earlier than it sounds! ); talk to a lady who remembers working at Milton Court during the war years, and enjoy an feature from Good Housekeeping of 1922. And this month, instead of a cup of tea, we offer a mug of best bitter! 07 Why Register as Sight Impaired? Never mind the weather: it’s March, so it must be Spring! In this month’s Dorking Talking we feature the Food Float: a community venture selling local eggs, bread, meat, veg and more from farms around the town. And you can’t get more local than Dorking’s very own gin: it’s called Gutsy Monkey, distilled in the town and featured in Fortnum & Mason. After which, you might want a cup of coffee – and we’ve got that too. Still on the subject of food, there’s Time For Tea at The White Horse, the coaching inn in the High Street, and an invitation to a tea party as well. Suitably fuelled for the month, we turn to a couple of ideas which make life easier for people with sight loss: accessible bank debit cards and illuminated power sockets. We take an affectionate look back sixty years to advice handed out to young people in 1958, and memories surface from still further back about a bomb falling in a Beare Green back garden. And in our series Meet the Volunteer, we talk to Reader Maureen Flood before the Thought for the Month. February’s here – and with it the latest edition of Dorking Talking. Join us to discover events coming up in Dorking, and check out an alarm clock that will make sure you don’t oversleep and miss any! We hear about helping older people with all the sorting out that goes with moving home, and find out about the Repair Café offering help to mend, rather than throw away, old clothes and gadgets. We discuss the merits of walking, with a glance at the health of your dog too. We find out what’s available in the way of audio-described tv programmes, and we look back at a century of Valentine cards before introducing our latest and youngest volunteer, Joshua Brown. And after all that – budge up! – we’ll squeeze in a thought for the month before we go. Happy 2018 from Dorking Talking! We set off into the new year with a lighthearted look back over decades past. Then we’ll be looking ahead with NHS advice on keeping healthy this winter. There’s inspirational painting by visually impaired artists, a poem by an extraordinary blind youngster and we hear from a local Down’s Syndrome support charity. We go outdoors to rediscover Nonsuch Palace and, on a less happy note, hear from our rather dejected Rambling Reporter, who’s temporarily confined indoors. We look into the difficulties of getting a taxi if you have a guide dog and join Mark Davis in time for a cup of Tea at the Lavender Goose in Gomshall before giving you a goodbye hug. What’s Dorking Talking about? Well with baubles and Santas everywhere, this month we bring you Christmas tales, Christmas shopping and some ideas to help you enjoy the big day with the grandchildren. There’s news of seasonal events in the town, as well as a look ahead to some dates for your diary. And with that in mind, we search out diaries and calendars designed for people with sight impairment, and also scanners and magnifiers to help you read the cards and enjoy the Christmas crafts. We’ve got a delightful seasonal story, we hear about Christmas in Surrey across the years, and we meet volunteer Reader and Recorder for the Talking Newspaper, Linda Thyer. 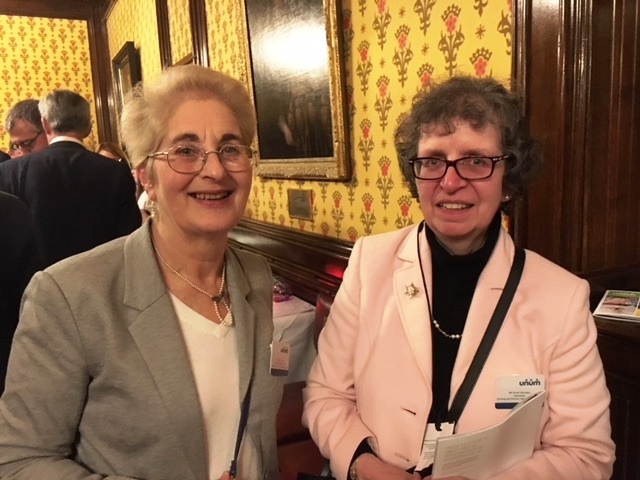 Thanks to our sponsors Unum, who invited Chairman Sarah Sheridan and Magazine Editor Jessica Thurtell to a reception at the House of Lords, hosted by Lord Hayward. In March this year, DDTN submitted a copy of the week’s edition for appraisal by a panel of independent reviewers from the Talking News Federation, the umbrella organisation for TNs across the country. They looked at criteria ranging from the mix of content in the recording to how well the readers’ performed and the sound quality of the recording itself. The acid test was how much the reviewers would like to listen to this TN regularly if they lived in the area. Some of the panel of reviewers are volunteers with other Talking Newspapers, others are TN listeners, visually impaired themselves. Overall the comments were very favourable – DDTN scoring 4.5 out of a possible 5.0 points. The Dorking Talking magazine, which is added to the TN on the first Thursday of every month, was described as “Simply excellent, superbly presented… with items of interest to all”. The panel only came up with one real criticism – at present DDTN don’t mark the recording when it changes on from one news item to the next. This would allow listeners to either skip an article or listen again to something they wanted to repeat. DDTN don’t yet offer this but, having read the review, they plan to introduce it in the coming months. One reviewer commended the readers for their “beautiful enunciation and unhurried pace”, while another commented: “This is one of the nicest Talking Newspapers we have listened to”.